Most of the heat exchange in your home takes place in your attic. Due to ventilation, it is easy for heat to enter your home in the summer and because heat rises, it can also escape in the winter, which means your AC unit has to work harder to combat the heat seeping in from the attic in the summer and your furnace has to produce more heat to make up from what’s lost through the attic in the winter. This can cause wasted energy and high energy bills. 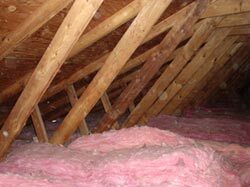 One of the most popular ways to increase energy efficiency is with fiberglass attic insulation. A home energy audit can help identify where your home is losing the most energy, and if your attic is the culprit, rest assured that the insulation experts at Arango Insulation can help you solve all your insulation needs. Whether you are trying to save energy on your power bills or you are updating or upgrading your home insulation, we have all the attic insulation products you need. From insulation batts to loose fill and spray foam, we have quality insulation products from some of the most trusted names in the industry. For more information about our fiberglass attic insulation and other home insulation products, contact us today. We install attic insulation in Newnan, Lilburn, Chamblee, Dunwoody, Cartersville, Kennesaw, and other communities throughout the Atlanta Metro area.